Following Sabrina Orah Mark's recommendation, I watched the pilot episode of the FX series Baskets. Hooked instantly, I watched one episode every day for a month until I was finished with the third (and most recent) season. With each season and with each episode, I was captivated. The show's desert magic, the humor that might make you cry instead of laugh. Full of American consumerism, identity crises, and dry comedy, the show's strengths exist within the unique characters. Perhaps the most notable is Louie Anderson's character Christine Baskets, the mother of two sets of twins: one set played by Zach Galifianakis and the other set made of up DJs that tour with Sneaker Pimps and Chemical Brothers. How's that for a California gothic? 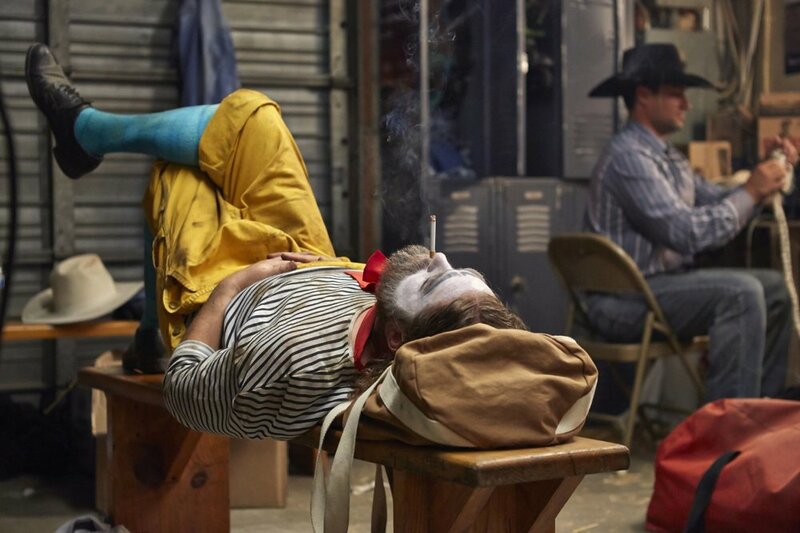 The series began as a singular character piece that largely followed around Baskets the Clown aka Chip Baskets aka Zach Galifianakis as he travelled from Paris to Bakersfield, California and everywhere in between. Hell, he was on a train for a large part of one season. As the series has progressed, however, Baskets has evolved to cover plenty of side stories and character pieces, oftentimes placing Chip in the background. The growth and development throughout for these notable characters is astounding. It seems that every character, whether they want to believe it or not, is on a never ending search for meaning. In doing so, almost all of the characters fall flat or trip along the way. They deal with suicide, heroin, running away, cowboys with guns, senior prostitutes, and more. Mixing rodeo clowns with Arby's with juggalos with CostCo insurance makes for very thought-provoking and profound television. Television where you might laugh out loud and grow teary-eyed in under a minute. As I said before, the show runs on strong characters, and my personal favorite is Martha Brooks (played by Martha Kelly). I love when actors/actresses keep their same name and jump into fiction. Three seasons in and Martha has yet to remove her cast or raise her voice. She's often the piñata of the show, one that gets battered and helps the entire cast like a crutch they don't know they need. They interrupt her at work, they have her pick up the trash, they use her car when their motorcycle explodes. She's a loyal superhero and, hilariously, the most stable of the crew. I look forward to seeing what season four cooks up for Baskets and all of its absurdities and dark whimsies. As it stands, it's one of the strongest shows on television, and the first three seasons are truly something special, if not magical.